When I went back to the A684 and drove along it upwards, there were the Aysgarth Falls, one of the most famous falls in Yorkshire. A series of falls extends to nearly half a mile along the River Ure. They consist of the main three falls; the Upper, Middle and Lower Falls. The Middle and Lower Falls are the most spectacular, but to access them, we must descend and walk along the banks. The Upper Falls can be seen easily from the bridge over the river. 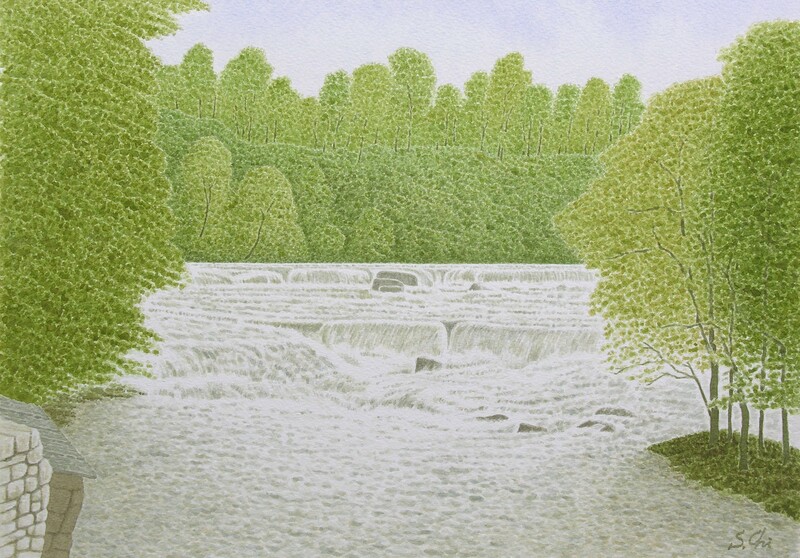 The Aysgarth Falls can be walked across from rock to rock in the dry weather. But after heavy rain or when it the thaws in spring, the falls turn to the violent ones, preventing people from approaching them. Turner visited here in 1816 and sketched the Lower Falls, painting it later in watercolours. The picture is also full of golden shinning light and hazy just like characteristic of him.